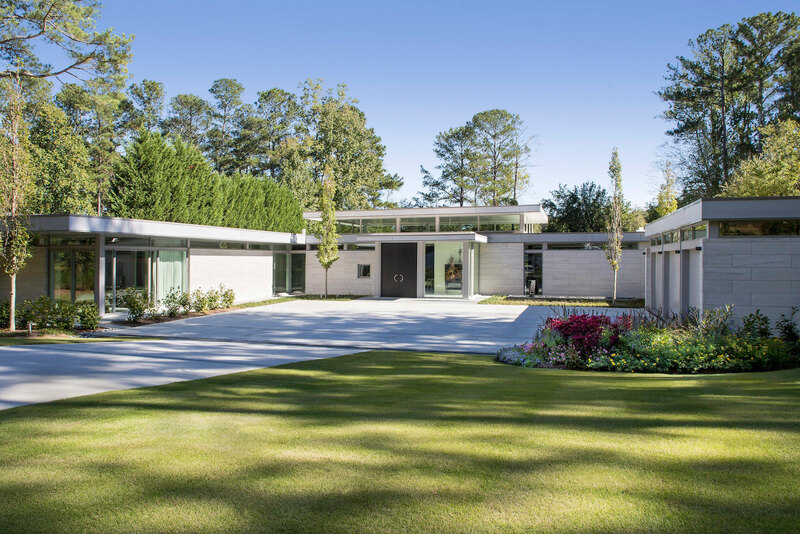 Located on a sloping 1-acre site in north Atlanta, the Sunshine House is designed to provide large interior and exterior entertainment spaces for a socially active couple and their adult children’s families. 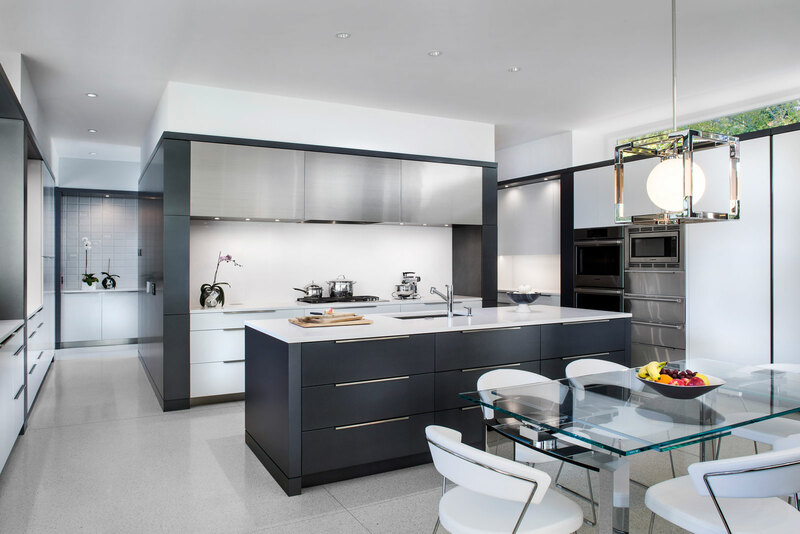 The interior entertainment space becomes the nucleus of the design by combining the living and dining areas into one large, high-ceilinged room located in the middle of the site with the house entry to the north and the exterior entertainment spaces to the south. 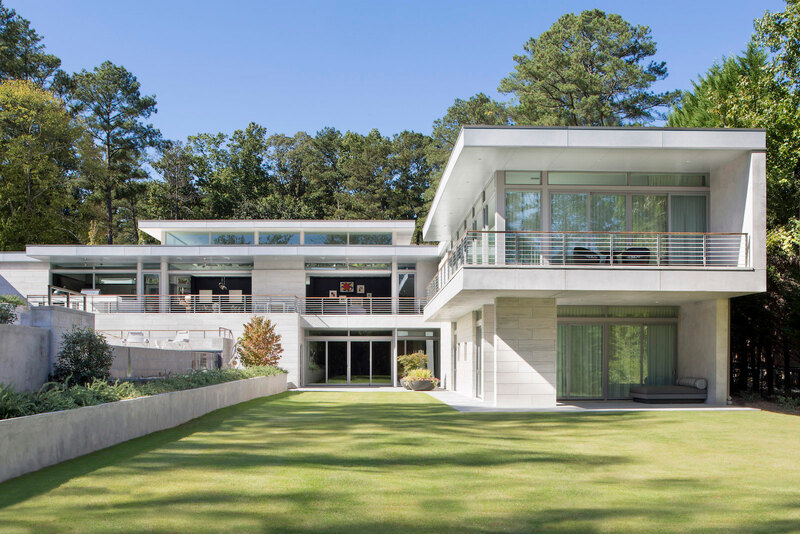 Bedrooms and workrooms create a wing running north-south along the east side of the site, and the kitchen, garage and connected pool house form a parallel wing running along the west side. 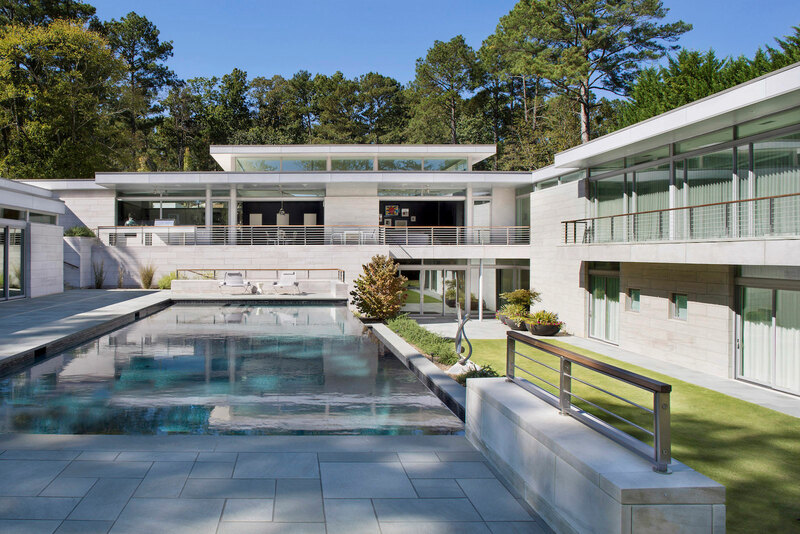 The resulting H-shape plan provides 2 clearly defined exterior spaces: a public entry court to the north and private exterior entertainment spaces to the south. The exterior entertainment spaces incorporate various terrace levels that respond to the site’s 1-story drop from north to south. 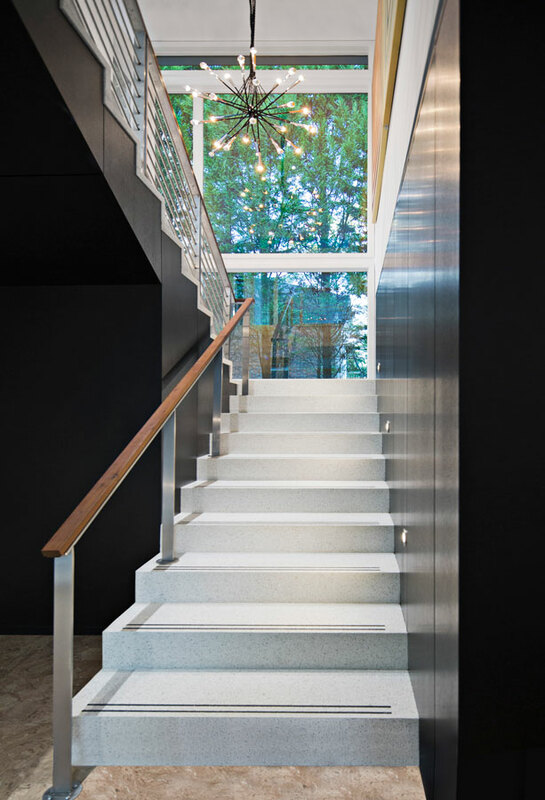 A covered terrace stretching across the length of the upper level’s entertainment space is linked to the pool terrace 6-feet below by a large stone stairway positioned between the kitchen and pool house. Stone steps and terraced landscaping along the north and east sides of the pool complete the 1-story descent to the lower level terrace below. 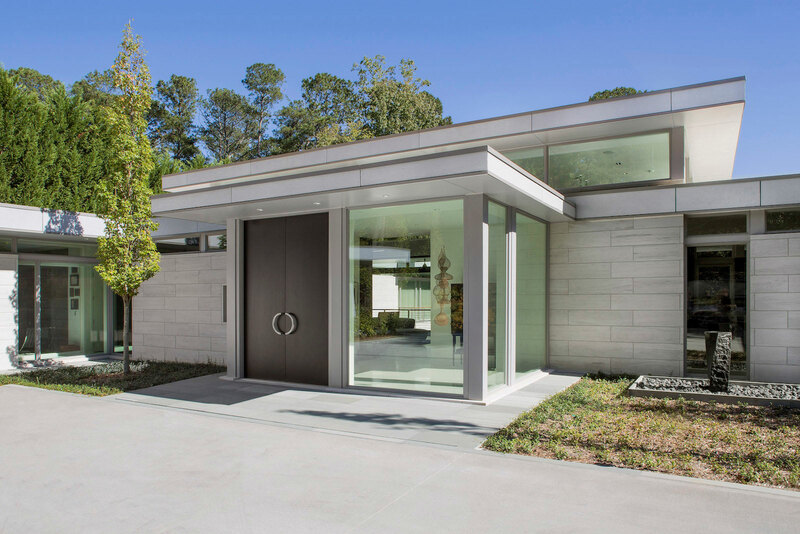 Floor-to-ceiling windows and large sliding glass panels are used throughout the house to blur the line between interior and exterior space, and solid exterior walls clad in horizontal limestone panels are designed to emphasize the contrast between solid and void. 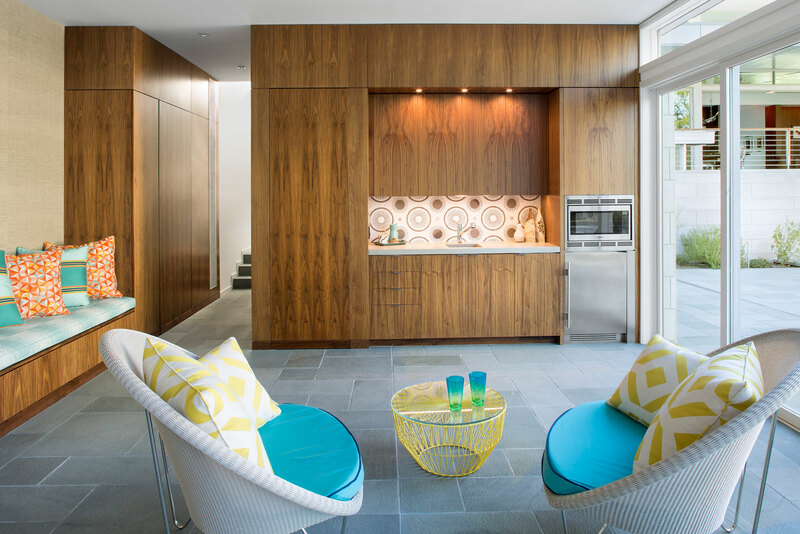 Clerestory windows separate the solid walls from the roof, creating a “floating” roof effect. These floating roofs and cantilevered balconies establish strong horizontal planes that reinforce the design’s integration with the site, provide cover for exterior space and protect the interior from summer sun.